Read the full Behind the Badge feature by Lou Ponsi here. 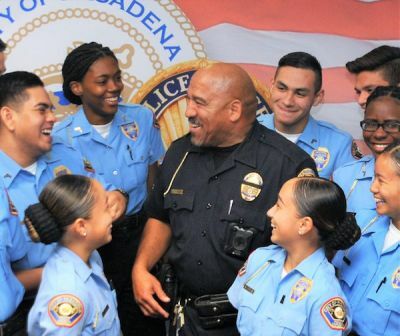 For some Pasadena Police Explorers, their first impression of Sgt. Glenn Thompson, their advisor, roused a bit of trepidation. The booming voice. The eye-to-eye glare. The gripping handshake, all within the frame of an NFL linebacker. But then comes the wide smile, the hug and words of encouragement and the apprehension melts away, replaced by the feeling that this man cares. Continued on Behind the Badge.